It's Halloween and Marshall and Simon are stuck at home babysitting Simon's younger brother Harley. But the night isn't as boring as they expected, when Harley switches places with the mummy from the monster movie he's watching. Marshall Teller: Does the word mega-eerie-voodoo-weirdness mean anything to you? 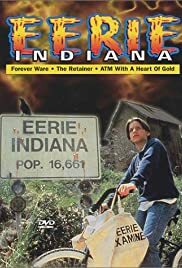 "Eerie, Indiana" was a well-conceived but less well executed series. The fifth episode "Scariest Home Videos" was a notable exception and probably the best episode of the entire series; certainly the best of the early episodes. On Halloween night Marshall and Simon are stuck at Marshall's home passing out candy to the trick-or-treaters in the neighborhood and minding Simon's little brother Harley. Some dimensional accident causes Harley to switch places with the mummy monster in the old film he is watching on television. This makes for some great fun as the hyperactive Harley proves much more threatening to the scream queen in the mummy movie while the mummy turns out to be a long deceased English actor (nicely played by guest star Tony Jay). Amazingly Julie Condra (playing Marshall's sister Syndi) actually gets some screen time in this episode and an extended close-up. Condra, television's answer to film's Deborah Foreman, was woefully underutilized in this series. This beautiful actress was seemingly cast to expand the target audience by enticing high school boys to view the shows. It was a good idea but someone forgot to tell this to the writers who typically limited her to one cameo in a wide master shot and a short throwaway line; after which she would go missing until the next week's episode. And they wonder why these things don't last more than one season.